These roofs are the traditional approach to flat commercial or industrial roofing in North America. 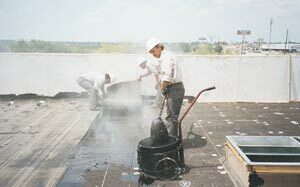 Multiple layers of felt with interply moppings of asphalt or coal tar are assembled in the field to build up a finished roof assembly. 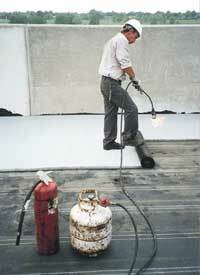 A heavy application of asphalt or coal tar is then covered with gravel primarily for fire proofing purposes. Built-Uproofing Systems (BUR's) are best utilized when roof areas have a very low slope and ponding water is likely. Coal tar is completely impervious to ponding water, one of the few roofing materials with that attribute. Coal tar also has a low melting point, which means in the summer months, the coal tar becomes fluid and will self heal . Asphalt BUR's are best utilized when roof areas have a significant slope or the low melting point of coal tar might cause slippage of the membrane. Normally any roof system in excess of 1/4 per running foot of slope should use asphalt if the building owner requires a built-up system. Asphalt roofs can also be in a smooth surface installation if the gravel finish is undesirable to the building owner. Modified Bitumen systems are similar to their built-up-roof cousins, i.e. : they come in two generic families. These types of systems are popular with owners that like the redundancy of a multi-ply roof assembly, but do not like a gravel surface roof or are looking for something that is easier to maintain. The families are called APP and SBS types and these names are acronyms for their chemical names. In either case, a material has been added to standard roofing asphalt to modify its characteristics to weather better under normal climactic conditions. APP materials have been modified with a plastic material which basically encapsulates the asphalt molecules. SBS materials are modified with a rubber-like synthetic which in essence becomes part of the asphalt molecule and changes its characteristics. Generally speaking, APP products are smooth surfaced and require some type of coating as a top surfacing to achieve a fire resistant rating which is required in many localities by building code. SBS products generally come with granule surfacing and a fire retardant in the product in order to achieve a fire resistant rated roof. EPDM roofs (or rubber roofs as they are often called) are extremely popular because they are considered a single-ply roof. They have the largest market share of any single-ply material. 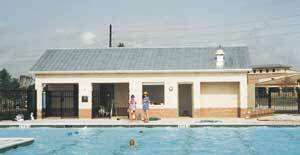 EPDM roofs are the first choice if up-front costs are the primary criterion for purchase. With rising construction costs, EPDM roofs will remain popular. As with any roof, the ultimate life and durability of the roof is directly related to the quality of the initial installation. Metal roof systems have become very popular in the last ten years. BA-COR installs all types of metal roof systems, whether they be architectural, structural or custom designed and fabricated. BA-COR also installs all the sheet metal terminations on the flat commercial roofs that we build, ensuring single source responsibility and accountability. Many other roofing contractors subcontract such work. Our dedicated craftsmen design and fabricate all metal shapes in our complete state-of-the-art metal shop. 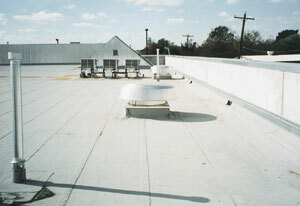 BA-COR installs all types of coating system technologies over existing metal, BUR and single-ply roofs. In many cases it is possible to extend the useful life expectancy of a roof by 10 years through the selective use of appropriate roof coatings. 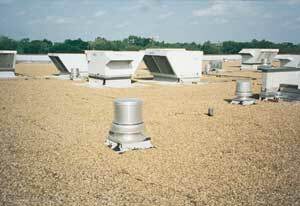 Aluminized coatings on built-up roofs can reduce the roof surface temperature and reduce the rate of surface oxidation. Elastomeric coatings on singly-ply and metal roofs are acceptable for roofs that would otherwise be reaching the end of their service lives.